With the snow falling outside there is nothing more calculated to bring a feeling of warmth than a disc of guitar music - helped along with a mug of hot chocolate with added brandy. There seems to be something intrinsically sunny about the sound of a guitar perhaps because of its association with Spain and Latin America, where days are blessed with sun and blue skies, to a greater extent than where I’m sitting anyway. With the huge success of the latest guitar phenomenon Miloš Karadaglic other new names on the guitar scene might go unnoticed. It is to be hoped that this will not happen to Marco Ramelli who at under 30 is already the Artistic Director of the Festival Corde d’Autunno in Milan as well as pursuing an active teaching career. 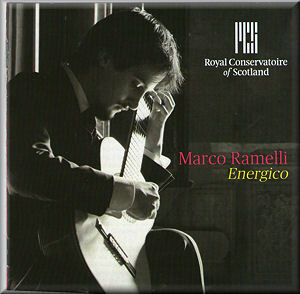 Ramelli only began studying the guitar at the age of 19 yet in a few short years managed to win the inaugural Scottish International Guitar Competition in 2011; he was a worthy winner on the evidence of this disc. They say you learn something new every day but as a reviewer I learn several things every day. One of today’s revelations was to discover just how much guitar music was written by Niccolò Paganini the 19th century violin sensation, with over 200 works involving the instrument. His three part Grand Sonata, which dates from 1803 when Paganini was only 21 is delightful with more than a whiff of folk melodies about it. As Ramelli writes, it was one of the most important works for the guitar of the period and, along with others of his works, anticipates “the first specialist guitar composers of the nineteenth century”. Not being a guitarist but knowing Paganini’s reputation I can well imagine that it is a work to be played by the skilled professional. Ramelli makes it sound simplicity itself. According to his notes the Spanish guitarist-composer Miguel Llobet is another “pivotal personality in the history of the instrument”. He specifically wrote works with the guitar’s unique qualities in mind rather than using the piano and violin as a basis for composing such pieces. His output for the instrument numbers around a hundred pieces. His Popular Songs of Catalonia were written in the period 1899-1918. They are lovely evocations of that wonderful part of Spain. Llobet extends the scope of these otherwise simple songs by fashioning them into an exploration of the guitar’s potential with beautifully satisfying results. His Scherzo-Vals, dating from 1909 is a tongue-in-cheek amusing parody of a waltz. Interestingly Rory Boyle’s Partita a quattro which is a reworking of his previous Sonata for guitar ended up as a test piece for the competition that Marco Ramelli won. Indeed the first movement is marked Energico from which the CD gets its title. What goes around comes around they say and it is not without significance that Boyle, a native of Ayr, was himself a composition student at the Royal Conservatoire of Scotland where the competition was held and where he is currently a tutor in Composition and Creative andContextual Studies. His Partita is a really interesting guitar work that has both a contemporary as well as a timeless feel. Melodically it seems a far cry from its composer’s Scottish roots while the tempo indications are very accurate in their descriptions of each movement’s moods. Toru Takemitsu’s music has always been a favourite of mine with its highly individual and dreamlike sonorities. Ramelli’s choice of his pieces are a perfect way to round off the disc. First there’s a marvellously coloured representation of a painting by Cornelia Foss then two songs, the first by Harold Arlen, the wonderful Over the Rainbow, and finally Lennon and McCartney’s magnificent Yesterday, surely two of the most well known of all songs. Both are given a sympathetic reworking by that brilliantly inventive composer. If snow is still a feature where you are and, even if not, bring a little sunshine into your life with this enjoyable debut disc from a young guitarist about whom I’m sure we’ll hear a great deal more.